Step inside Silver Lane and everybody has their own space. The main floor opens into the great room with comfy leather furnishings, gas fireplace, and heater surround sound for movie night. The vaulted ceilings and the floor to ceiling windows take in the incredible Elk Mountain views and add to the feeling of spaciousness. Of course, at 5200 square feet, there is definitely plenty of space! The dining room table seats 10 and the bar area has another 3 spots, so everyone has a place. In the kitchen, there is an 8 burner wolf range along with an oversized Sub-Zero fridge for fantastic meals with the family. Just off the dining room is a screened in grilling and sitting porch for the Southern side in all of us! The master bedroom is also on this main level with a king bed, tons of windows and access to the outside decks. The master has it's own large sitting area and master bath with jetted tub and steam shower. Downstairs you will find a second master suite with king bed and en-suite bath that holds a surprise! Not only does this bath have a steam shower, it has a dry sauna that seats 6! Off this junior master is a sitting area with sleeper sofa and access to the back deck that holds the oversized hot tub. Positioned to take in the great views, the hot tub is also covered to be enjoyed in any type of weather. Down the hall you will find a full bath and two more bedrooms, each with a queen bed and their own style of furnishings. Continuing down the hallway, the West wing of the home houses the kids area. The large media room features a flat panel tv, leather seating, game area with a great Texas Hold Em table, and even a small fridge for drinks and snacks. There is a half bath on this level as well for convenience. Off the living room is a large bunk room with two sets of twin bunks for 4 the little ones to have their own space. Up the winding staircase from the media room is your third master suite with king bed and an en-suite bath that boasts a large shower with river rock floors and a jetted tub. In addition to the staircase, this suite also has access to the main living area via an outdoor covered walk. Let the kids play in the large back yard while you enjoy a glass of wine on the deck taking in the views. Regardless of season, Silver Lane is stunning home you won't want to miss! Katie was a big help with ski rental and lift ticket information. Not to mention giving us ideas where to eat. Thanks! Property was excellent. Only comment would be we couldn't get the house temperature down. So it was a little warm. Other than this it was fantastic. We enjoyed our stay at Silver Ridge. It was a nice comfortable property and very well equipped. We had everything we needed. We'd definitely stay again. What a perfect place to celebrate my grandmothers 93rd birthday. Our large family took advantage of the open kitchen/dining/living/deck area to visit in small and large groups. There was plenty of space in this beautiful home for the grandchildren to play or to find a quiet place for reflection. The views from all the rooms were awesome and the deck . . . Wow! A great location for the adventurers in the family as well. Thank you so much for a wonderful experience at your beautiful home on Silver Lane. Our group had an excellent time and enjoyed the amenities at your property. My boyfriend proposed to me on the mountain and we were able to celebrate back at the house with all of our friends and family. It was so nice having a place that felt like home, and being able to relax after a long day of skiing! We are hoping after the wedding to make our stay at this beautiful property an annual event. Great week of skiing, eating, and relaxing. We love Silver Lane 9! Steve, Jennifer and Katy are eager to ensure a most pleasurable experience and stay. They are responsive and professional. It was valhalla, thank you so much for all your help and professionalism. Things were attended to with the upmost speed and courtesy! Complete comfort and convenience for family. From bedrooms/bathrooms/gathering areas to wine cellar to steam/sauna plus over the top kitchen that made our food prep soooooo easy this has to be the finest rental we have ever experienced over 25 years!!! Location great and views even better!!! Would move in if I could!!! Fantastic!!! Entire process could not have been more simple. After a call to Iron Horse describing the group and dynamics, a few homes were recommended and one was advised to be perfect for our group. The home was beyond perfect for my group and couldn't have had better set up and views! Great home and great value. We will be back! Crested Butte is an amazing place. What ski towns used to be years ago is what CB strives to be. Family oriented, lots of space, privacy, and fantastic social scene. The home we rented was great for our group of 10. Lots of space and lots of privacy all in one place. Kids felt like they had their own space while adults could enjoy their time late evenings without bothering the children. 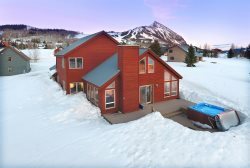 We will be back and surely call Iron Horse to reserve another great home in Crested Butte! The house layout was perfect for our family. Want to stay there again. One suggestion-not complaint, bread knife!! MANAGER RESPONSE Thank you for the suggestion. We have ordered a bread knife and it will be in the home for your next visit. Thank you for staying with us and we look forward to seeing you soon. Safe Travels! Things were attended to with the upmost speed and courtesy! Steve, Jennifer and Katy are eager to ensure a most pleasurable experience and stay. They are responsive and professional. Great week of skiing, eating, and relaxing. We love Silver Lane 9! Steve was a real pleasure to work with. He responded promptly and was very knowledgeable about the property and surrounding area. The only thing I would comment on was the condition of the outside grill. You may want to spend $300 to get a new grill. This unit was in pretty poor condition thus making it very difficult to cook on. We had to ad lib each night as we grilled out. Everything else was top shelf though. Thanks again. Carl MANAGER RESPONSE Thank you for your comments. We have notified the owner about the grill and will be replacing the unit in short order. Thank you for your comments and helping us maintain and offer the best vacation rentals in Crested Butte! We look forward to having you stay with us again. Safe travels. We had a repair issue which was handled in a most efficient and friendly way. We did not report the issues we had with the icemaker, as I know that these Sub-Zeros have a problem, and we just bought any additional ice we needed....but, you may want to check into this. MANAGER RESPONSE I am so sorry you had an issue with the ice maker during your stay. We have notified a sub-zero repairman and are having the issue addressed. We strive to have the best equipped and maintained vacation rentals you will find anywhere. Thank you for bringing this to our attention. We look forward to your next visit. This was an amazing house, and our family thoroughly enjoyed our stay. While our dates for next year are not yet clear, we would certainly stay here again. We have had this annual family reunion for over 7 years, and this is by far the best equipped home we have ever stayed in.....even the knives were sharp. The kitchen in general was amazing and the layout of the home worked very well for us. We would be happy to write a review elsewhere if you would like us to...Please thank the family for making their home available. I have always enjoyed working with the Iron Horse Property Mgmt, whether it is the person on the phone or the individuals coming to the house when needed. We always love staying in CB. The home works wonderful for our families and kids, plenty of area to stretch out and get comfortable and super easy for going skiing. We loved everything from the ease of check in with the lockbox to the leather bound instruction book inside the house and the luxury soaps/shampoos/toiletries were delightful! We will be back. We loved that there were 2 high chairs as well as crib/pack-and-play available for kiddos and plenty of space to fit our group. The hot tub was well maintained and we loved the new patio/porch furniture as it was nearly 60 and Sunny for our Feb ski trip. You all were a joy to work with thank you for giving us such a fun and memorable trip. We could not imagine staying any where else in Crested Butte. We will be lifelong customers and hope to refer as many friends/family to you all.